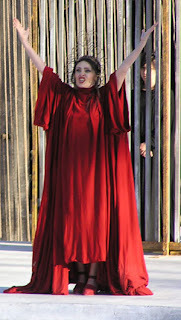 Two days ago I posted a flash fiction snapshot of Clytemnestra, wife of Agamemnon who led the Greeks to Troy. 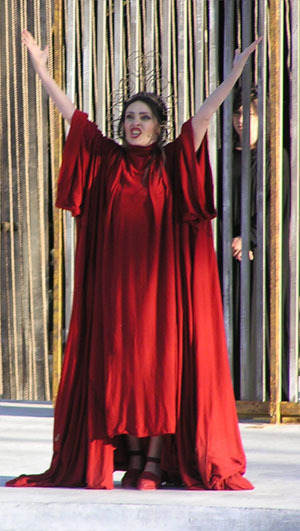 In that post, you saw Clytemnestra in the dark moments before she takes her revenge on the husband who sacrificed their eldest daughter. This piece is set seven years before that. The people of Mycenae are starving and the people turn to the old ways for their salvation. In this I'm exploring the idea of an earlier, matriarchal religion, which was supplanted by the Greek pantheon. It is inspired by Classical Mythology: the Greeks by Peter Meineck (available on audible) and by Henry Treece's Electra, an amazing book which first introduced me to this story. The sheep lies on its side, belly distended and tongue hanging from its open mouth. Flies buzz around its blank staring eyes and the stench of death hangs in the dry air. It is three years since Agamemnon left, taking our most able-bodied men with him; three long years of failed harvests and grass fires. Brown scars wound the land where cool water once flowed. The people starve. Black robed, I gaze from beneath the massive lintel of Mycenae’s lion gate, out across a land which had once been verdant. “Mother?” Elektra says, her hand on my elbow. “The Gods of Agamemnon have abandoned us.” I am a desert wind, scalding in my dryness. Lifting the double horns above my head, I hear a ripple of recognition run round my hollow eyed people. I am the Goddess reborn, the dark one, a creature of the moist earth and green shoots. I nod at the first lithe youth who stumbles forward. The chosen seed. He follows in my narrow footed wake, down the winding stone path to the arid fields, scorched by the unforgiving sun. I smell nothing but dust, see nothing but the red-brown earth baked hard by summers without rain. The sacred tree stands before me, rearing black and twisted against the blazing sky. Stretching, I place the spreading horns within its gnarled branches and turn to face the chosen one, the boy-consort who will seed the earth. His eyes are wide, liquid dark in a face which has its first growth of downy beard. Sweat beads his brow and his curving lip. He blinks, dazed by heat and wonder. Power ripples through me. Lifting my hands to my shoulders, I bare my white breast to his hungry gaze. Hands trembling, he reaches out to touch me, reverent and worshipful. As his skin brushes mine, thunder rumbles in the distant mountains. The people gasp and around the city walls, voices swell in joyful eulogy to the burgeoning sky. I pull him to the dusty ground, and lose myself to the heat of his mouth. But as the ancient rhythm overtakes me, I see Elektra’s face in my mind’s eye, stark with shock, pale with anger. I close my eyes against the thought. One day she will understand what the Goddess demands of those who live in her curved palm. One day she will forgive. The boy cries out. Lifting my face to the skies I smile, as the rain begins to fall. Sorry I've been gone so long. Seems like I've missed a lot over here! Seems the matriarchal Goddess religion is much more life affirming than the sacrificial oriented pantheon that supplanted it. I like this method of ending droughts much better! Unfortunately it is not one of the myths I'm actually familiar with, so the characters are unfamiliar to me.